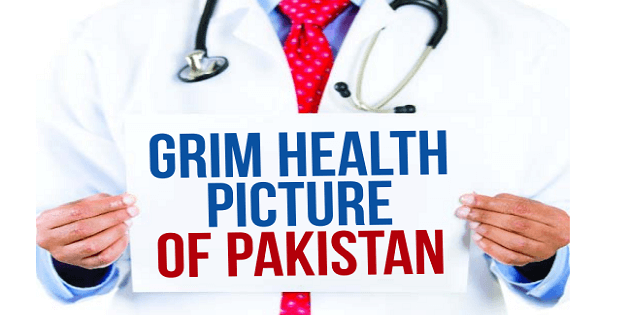 The health picture of Pakistan is grim and grave to every thinking Pakistani. Out of 190 nations, Pakistan stands at 122 as far as health related problems are concerned according to a World Health Organization performance report. A nation comprising 200 million is mired in different kinds of health problems due to different reasons. Infant and mothers death at delivery time is the worst in Pakistan as compared to the any other country of the world. Life expectancy which is the lowest in comparison to south Asian countries which is 66 years (Male 65, female 67), The proportion of population which has access to improved drinking water and sanitation is 91% (2015) and 64% respectively. The health indicators do not present a good sign for the future of Pakistan which is directly related to the health of its citizens. The total expenditure on health per capita is 129, which is only 2.6% of GDP. The 2030 agenda of Sustainable Development Goals (SDGs) incorporate 169 targets and 17 goals that UN member states are expected to localize in their socio economic policies during 2015-2030. SDGs Goal-3 and Goal-6 relates to health of people and undertakes a commitment to end endemics of AIDS, TB, Malaria and other communicable disease by 2030. One of the SDGs targets is to end the global TB epidemic. Health profile of Pakistan is directly affected by high population growth. Every year a heavy amount is allocated for this sector. However, despite a significant investment in health sector over the years, the rate of progress is lower than most other countries. The disease pattern is heavily dominated by malnutrition and poor dietary practices. SDGs is a national commitment to improve health outcomes. The federal and provincial/area governments all developing, implementing and monitoring health sector strategic framework to achieve health related SDGs. Health spending is slow but persistently rising. The country is spending 0.5 to 0.8 percent of its GDP on health over the last 10 years. These percentages are less than the WHO bench mark of at least 6 percent of GDP required to provide basic and life saving services. To achieve universal health coverage, a National Health Program has been launched under the guidance of the Prime Minister by Ministry of National Health Services, Regulations and Coordination (MoNHSRC). The program will help millions of poor to access quality health care services. The package of the program is: o Secondary Care: Rs.50,000 per family per year o Priority Diseases: Rs.250,000 per family per year It is sorry state of affairs that Pakistan lags far behind most developing countries in women's health and gender equity. The infant mortality rate was 86.0 per 1000 live births in 1996 and 83 in 2017. The mortality rate for children under age five 140 per 1,000 births exceed the averages for low-income countries by 60 and 36 percent, respectively. 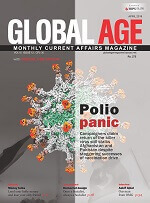 The conundrum of gone-up life expectancy in Pakistan is simple as during the last several decades the human control on killer epidemics has resulted in rise in life expectancy. Despite the increased use of contraceptives increased, fertility remains high, at 5.3 births per woman. Population growth rates are much higher than elsewhere in South Asia. The maternal death rate per 100,000 live births is 300-600. This reflects the poor reproductive health of the female, which is the consequence of discrimination against girl child from birth, son preference, inadequate breast feeding, early marriages, high fertility rates, poor birthing methods, poor ante & post natal services - low nutrition level. The health & well being of children is closely linked with that of the mother. 13 Million Children under 5 die each year in the developing countries. 7 million pre natal deaths are not only due to problems during pregnancy and labour but to poor health status of the mother. In Pakistan 74,800 children under 5 years of age die every year - 25 children in every 100 dies before even completing the 1st year of their life, 25% babies are born with low birth weight and 40% are malnourished signifying poor nourishment in the uterus, poor nourishment continuing throughout breast feeding, weaning, and child hood period. High rates of malnutrition cause infant mortality, stunting and physical and mental retardation.